After a year of learning at the side of my skilled and experienced husband, I can absolutely say my confidence has doubled, no, tripled, no, exponentially increased. Let’s just say, I can honestly admit that I think differently, move differently and communicate differently in the kitchen (and to be honest, it has overflowed into greater communication in our relationship…BONUS!). I no longer have hesitation in cooking without a recipe. I may glance at one for suggestions or ideas, but now I can take what “mystery box” ingredients I have available (similar to an episode of Chopped) and work comfortably toward a successful dish. I still use recipes occasionally, but mostly for baking, where specific measurements can make or break the outcome. In the case of the sauerkraut, a true sauerkraut is fermented for days in a salt brine, but I only had an hour until we wanted to have lunch. Hence a quick kraut, which is quite similar to a quick pickle application. I did “glance” at a quick sauerkraut recipe online, but from there I went on my instincts to grab ingredients and adjust the flavors. I had on hand fresh cloves of garlic, yellow onion, a large head of green cabbage, a friend’s homemade cider vinegar (made from her locally grown apples), distilled white vinegar, coriander seed, kosher salt and sugar. If I gave you those ingredients, what would you do? Here’s what I did. First, mise en place. I thinly sliced a half dozen peeled garlic cloves, half of a yellow onion, and about a third of the cabbage. I had the rest of the ingredients close at hand. Over medium-high heat, I brought a drizzle of olive oil up to temp and sauteed the garlic for a minute, then added onion and sauteed until translucent, then added the cabbage and tossed. I added some of the mild apple cider vinegar (let’s say a cup), a generous pour of distilled white vinegar, then seasoned with a sprinkle of the coriander seeds. 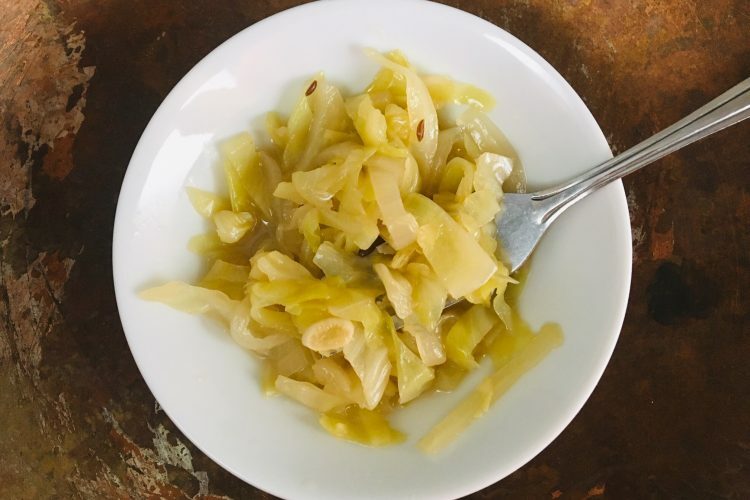 I added about a tablespoon of kosher salt and a heavy dusting of granulated sugar to balance and calm the acid from the vinegar and the sulfuric nature of the cabbage. I couldn’t tell you the measurements exactly, because I was going on intuition and taste, rather than specific measurements. Then I simply covered it, lowered the heat and let the cabbage mixture simmer for about 1/2 an hour until tender. That’s it. Pretty easy. Upon Chef Husband’s return home, he gave an impressive “thumbs up” to my kraut. He was then on point to handle the rest of the ingredients for our afternoon Reuben excursion. He brought the kraut back up to temp and drained it, then loaded it up on top of grilled sourdough, with corned beef and melted mozzarella cheese along with a generous douse of Thousand Island-ish Dressing (Chef Husband doctored up some Ranch Dressing we had on hand). For the purists, yes, Reuben sandwiches are normally prepared on dark rye bread, but we prefer sourdough. Sauerkraut is typically a shunned condiment by many, especially the store-bought, out-of-the-jar type. The strange color alone can be a bit foreboding. But in this instance, fresh proves to be best. My sister-in-law came by and professed she has never liked sauerkraut, but actually sat and ate several spoonfuls of the fresh quick kraut. Now, because I wasn’t following an exact recipe, I may not be able to recreate this specific sauerkraut again. But that’s OK. Each adventure in the kitchen is an opportunity to try something fun and new. Chef Husband confesses that he often doesn’t make the same thing twice. Confident cooking is simply knowing how to work with individual ingredients and improvising with what you have available at the time…maybe next time I have cabbage on hand, I’ll try making quick kimchi. Who knows?